preserve-order Is very Important attribute In TestNG. In Selenium WebDriver test execution, Many times peoples are complaining like my test cases execution not runs In correct sequence as given In testng.xml file but they are being executed In random sequence(unpredictable order). Actually they have copy pasted testng.xml file from somewhere with attribute preserve-order="fasle" but they don't know meaning of this attribute. Let me try to explain you meaning of this attribute. In testng.xml file, If you have not set preserve-order attribute with <test> node, By default It will be true. So your test class execution order will remain same as you have given In testng.xml file. Sameway, If you set attribute preserve-order="true" with <test> node, Your test execution will be same as given In testng.xml file. But If you set preserve-order="false", Your test cases will be executed In unpredictable order. Let me give you examples with preserve-order="true" and preserve-order="false" attribute. 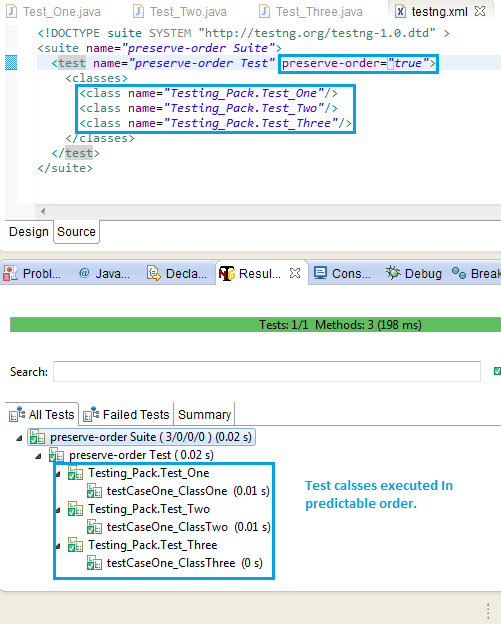 Create three test cases as bellow under package Testing_Pack. Create bellow given testng.xml file under your project to run all above test cases. If you will run above given testng.xml file, test classes execution order will looks like bellow. 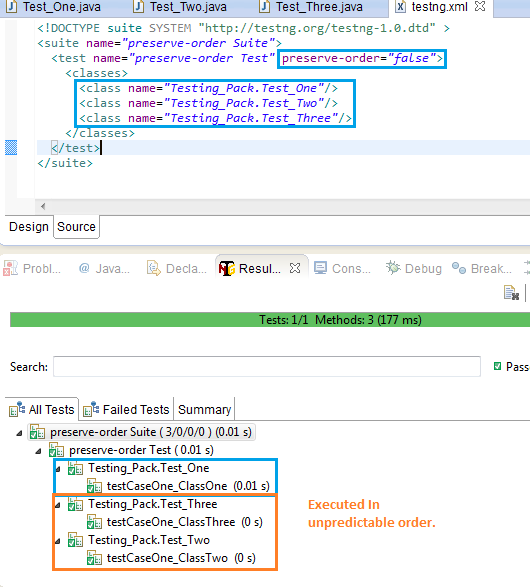 You can see that test execution sequence Is not same as given In testng.xml file. Now let us use preserve-order="true" attribute In testng.xml file as bellow and observe execution result. Now run above testng.xml file and observe test classes execution order. It will be same as given In testng.xml file as shown In bellow given Image. So this Is the example of using preserve-order attribute In testng.xml file. To execute test cases In correct order, you need to set preserve-order=true and to execute them In unpredictable order, set preserve-order=false. Thanks for the post, Interesting and very useful article to learn about Preserve in Testing.